Nina Moore wants to talk to you. She wants to share just a part of what she’s seen in Maine, Indonesia, and, now, the American West. A seeker of adventure constantly looking for new things to do, Nina struck out from her home in Maine after high school to work in Jackson Hole, WY for Grand Teton National Park as a summer trail crewmember. After growing up on the east coast, Nina chose Whitman College because it gave her “a backdoor to the West,” which, even after three years, still feels novel. In Walla Walla, Nina enjoys hiking and skiing in the adjacent “kinda mysterious” Blue Mountains and playing on the women’s lacrosse team. On Semester in the West, Nina has found joy in the simple things: “Where I am, and who I’m with.” Similarly, simple and pure passion for a place or a field is what inspires Nina. Ecologists Janet Millard and Paul Arbetan, in particular, fascinate her and have made her realize that following one’s passion is worth the accompanying pain of things not always going the right way. Taking Janet as an example, Nina knows that running one of the Northwest’s most important raptor migration centers at Chelan Ridge is a difficult job with ephemeral government funding. So why do it? Nina found a glimmer of the answer in the primal eyes of a sharp-shinned hawk in hand. It takes a “big-hearted person” with the right set of values to connect with a raptor, but it is these instinctive moments of connection with another species or a place that make bureaucratic infighting for resources a bearable chore. Through SITW, Nina’s attention has been drawn to communicating the important of places like Chelan Ridge. That story starts with endangered raptors, but ends with the people like Janet who work there; combining ecology and heartfelt stories of human passion. 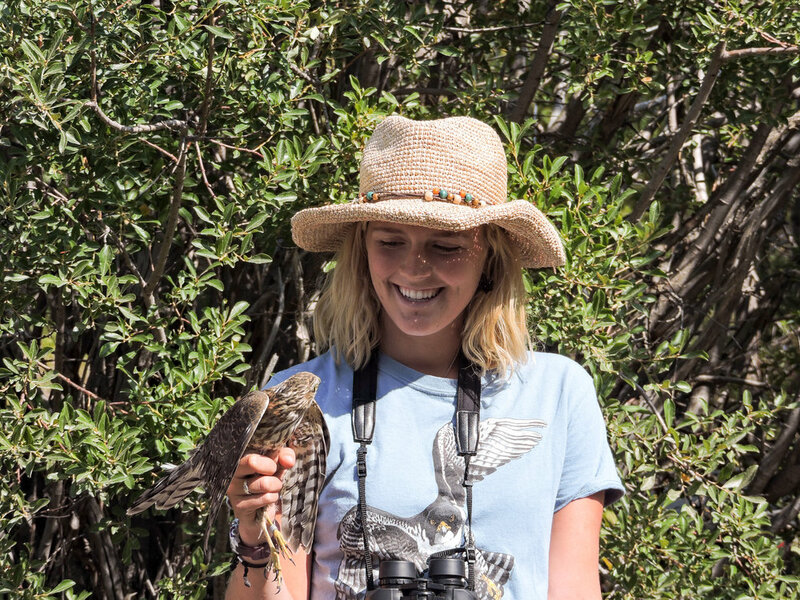 She hopes to start that work as soon as the program ends, coming to her spring semester classes with ecological principles, vignettes of environmental enthusiasm, and the knowledge gleaned from the amber eyes of a sharp-shinned hawk to share.